Diadumene lineata is a small anemone, growing to a maximum height of 3 cm. It has a smooth, cylindrical column that is usually olive-green or greenish-brown, but can also be gray-green or bright green. Often there are single or double orange, yellow, white or gray vertical stripes on the column, though some specimens are stripeless. The interior of the column is partitioned into spaces by thin walls of tissue, and the outer edges of these partitions where they attach to the column sometimes show through on the outside as thin vertical lines. The column is topped by a crown of tentacles that can be 3.5 cm in diameter on the largest specimens. There is a slot-like mouth in the center, with a substantial space surrounding the mouth that is free of tentacles. When extended the tentacles are slender and tapering, and are either pale gray, green, pink, yellow or transparent, sometimes with flecks of white in them. There are typically 25-50 tentacles, but sometimes as many as 100. 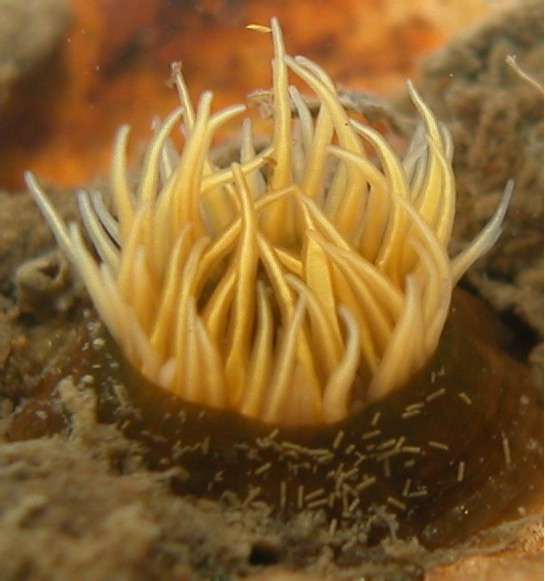 Diadumene lineata can reproduce asexually either by pulling itself in half along a vertical plane, creating two smaller anemones; or by pulling away from small bits of tissue around its base, each of which develops into a small but whole individual. Sexual reproduction has only occasionally been reported outside of its native range in Asia (Carlton 1979). Diadumene lineata is found in fouling communities in bays and estuaries, often on pilings or floats; occasionally on seaweeds; on oyster, mussel, clam and snail shells; on rocks and debris on the surface of mudflats and brackish marsh channels; and poking up through the mud from shallowly-buried rocks, shell and debris. In some habitats its abundance may be limited by the availability of hard substrate: in one study in San Diego Bay, increasing the mortality of a native hornsnail and thereby increasing the abundance of empty shells enhanced the settlement of Diadumene lineata, resulting in a nearly four-fold increase in density. Diadumene lineata has been collected at temperatures of 14-24° C and salinities of 18-34 ppt in San Francisco Bay; long exposures below 12 ppt are reported to be lethal. Diadumene lineata can protect itself from environmental extremes by secreting a mucous coating and encysting, which may enable it to survive long-distance transport under severe conditions. On the other hand, several cases of mass die-offs have been reported. In San Francisco Bay, Diadumene lineata is eaten by the introduced Asian nudibranch Cuthona perca. 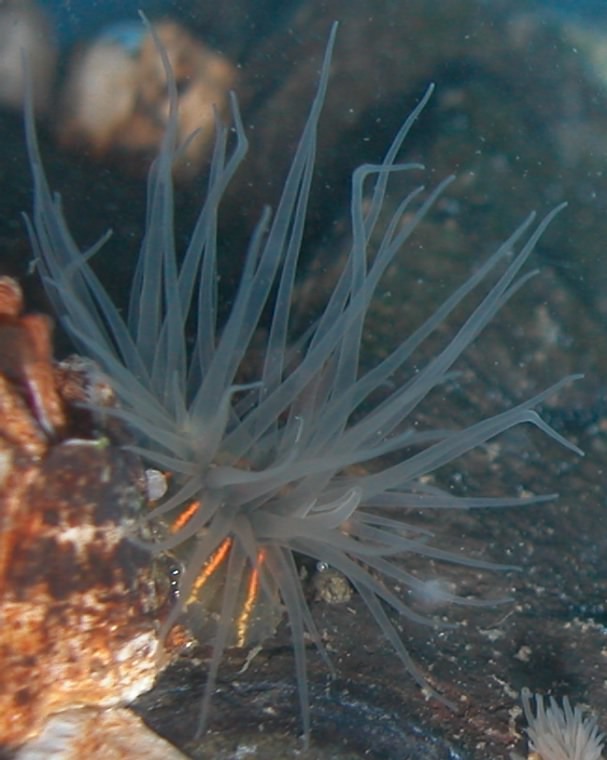 On the Pacific Coast, there are several small anemone (usually no more than 2 cm tall and 1 cm in column diameter) that are generally similar in form to Diadumene lineata. When poked or otherwise disturbed, all of these species (including Diadumene lineata) eject slender white threads, called acontia, through small openings in the column and through the mouth. 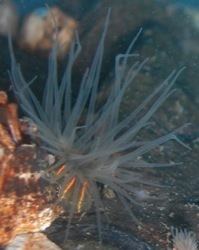 Any "acontiate" anemone that is encountered with a dark green column and/or orange stripes would be Diadumene lineata. As noted above, Diadumene lineata also occurs in other color combinations, but these can be distinguished from the other acontiate species described here (these descriptions are largely based on Hand 1956 and Fautin & Hand, in press). 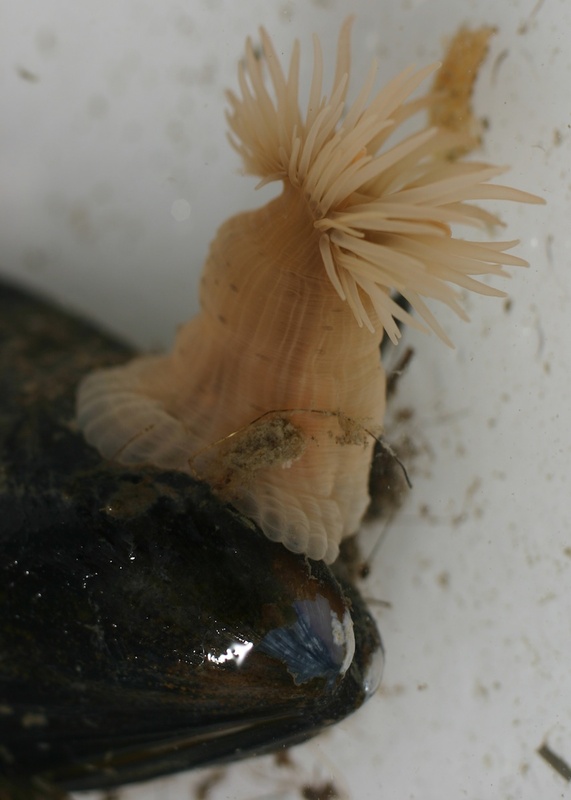 Diadumene franciscana is an exotic anemone that has been reported in several bays and harbors from Mission Bay to San Francisco Bay and Tomales Bay. 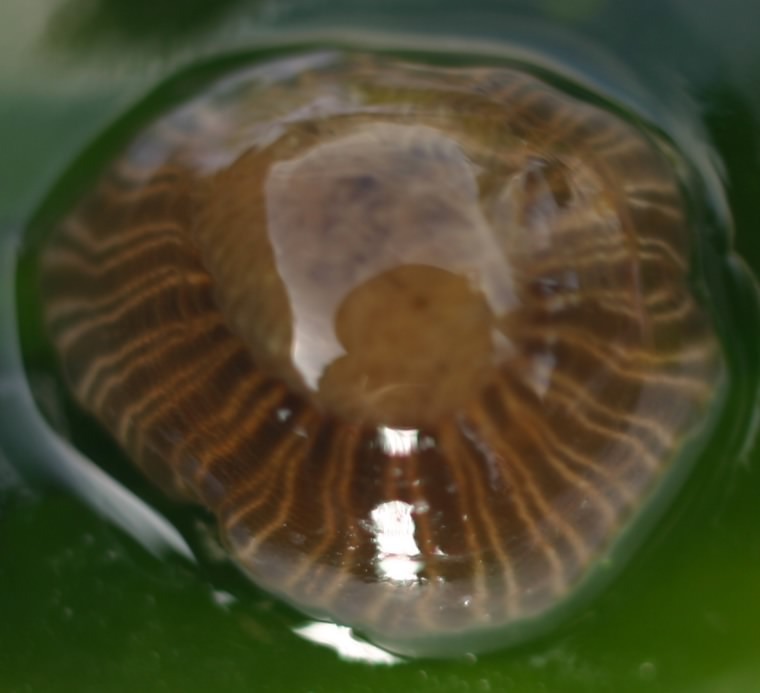 The two tentacles at either end of the slot-like mouth usually have yellowish bases, while the rest of the tentacle is white or colorless, and are set a little closer toward the center than the other tentacles in the inner row. In none of the other acontiate anemones are these two tentacles bi-colored with yellow bases. The column of Diadumene franciscana is pale green, cream or gray and translucent when extended. It often has up to 48 double or single white stripes on the column, but is sometimes stripeless. 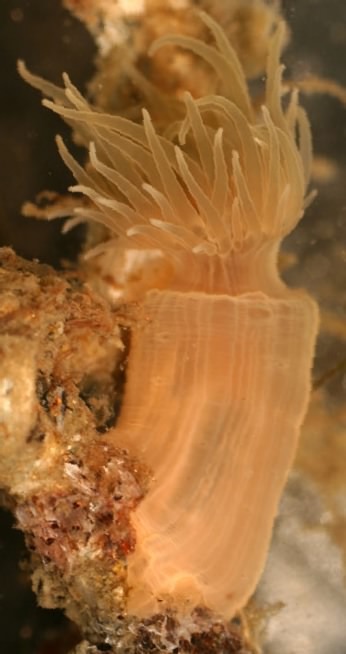 Three anemones have columns that are slenderer than in Diadumene lineata and stripeless, though the outer edges of internal partitions often show through the columns and look like white vertical stripes on the columns. Diadumene leucolenais an exotic species that has been recorded in bays and harbors from Newport Bay to Coos Bay, including San Francisco Bay. Its column is usually pale pink, salmon or white, though sometimes it is faintly greenish near the top. In the other two species the extended column is at least twice as tall as it is wide, usually only up to 0.5 cm in diameter, and translucent orange or yellow. Diadumene cf. cinctais an exotic inhabitant of bays and estuaries including San Francisco Bay, and its column is without bulges or kinks. Diadumene lighti is found on the outer coast, typically in sand among the holdfasts of seaweeds; its column usually has bulges or kinks and contracts asymmetrically. Metridium exilis is not as slender, with a column that is as tall or slightly taller than it is wide, and up to about 1 cm in diameter. It is orange or yellow, or sometimes reddish, and occurs on rocks on the outer coast. In two Metridium species that often grow taller than 2 cm, the tentacles are short and numerous (more than 100), the area without tentacles around the mouth is relatively small. and the tentacled margin around the top of the column is frilled. Metridium senile is white, brown or orange, and grows up to 5 cm tall. It is found on pilings, docks and rocks in bays and harbors. Metridium farcimen is usually white but sometimes salmon, brown or speckled; often has a deeply lobed margin around the top of the column; and can reach half a meter to a meter in height. It is found on pilings and docks in bays and on rocks and shells on the outer coast, down to a few hundred meters depth. In San Francisco Bay, Diadumene lineata is found from Rodeo in the north to Redwood Creek in the south, including sites with variable and often low salinity such as Lake Merritt. It has not been reported in the higher salinity waters near the mouth of bay. The history and status of Diadumene lineata in southern California is unclear. It was reported in Newport Bay in 1956, but it is unclear if a population is still present. 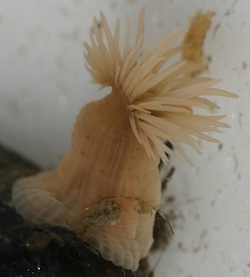 It was reported in Huntington Harbor in Anaheim Bay in 1973, but was not found in other invertebrate surveys in the bay in the 1970s; Carlton (1979) suggests that the record may have resulted from a misidentification of the similar anemone Diadumene leucolena. 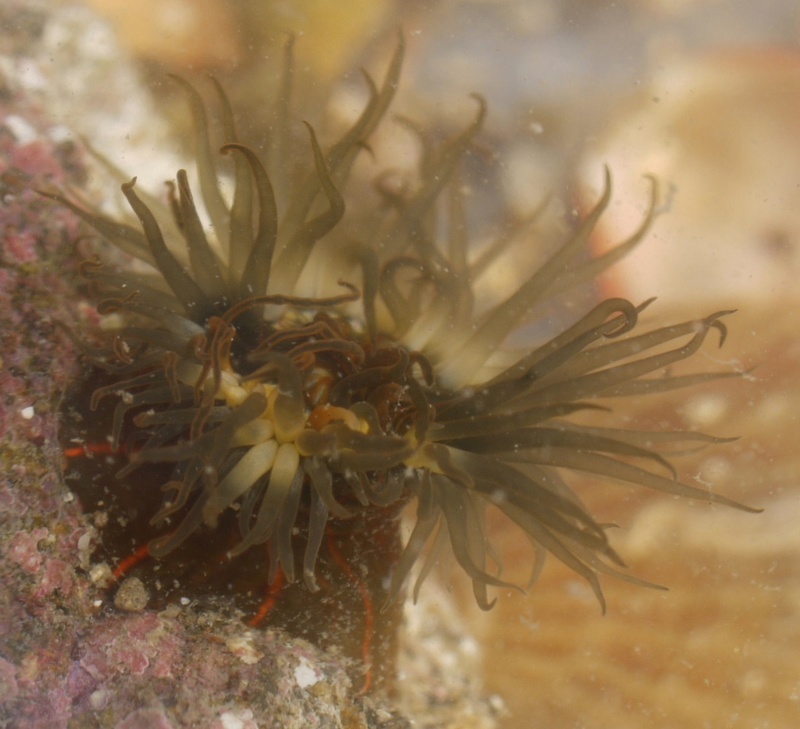 An anemone that was clearly Diadumene lineata was common in Mission Bay and San Diego Bay in 1927, was then not recorded from the area for half a century, and was reported again in San Diego Bay in 1979, suggesting a pattern of introduction, local extinction, and re-introduction. Diadumene lineata has been collected both from incoming oyster shipments and on ships' hulls. Its arrival in San Francisco Bay in 1906 after it had become established and spread on the Atlantic Coast (where it was first recorded in 1892), combined with its presence in Atlantic Coast oyster beds, suggest that it arrived from the Atlantic in the abundant oyster (Crassostrea virginica) shipments that were made around that time. Shipments of oysters (Crassostrea gigas) from Japan to San Francisco Bay did not begin until 1932. Populations at other sites may derive from a mix of introductions from Japan, from the Atlantic, and from other northeastern Pacific sites via both oyster shipments and hull fouling. For example, plantings of Japan oysters (Crassostrea gigas) preceded and thus could have been responsible for the first record of Diadumene lineata in Puget Sound, Willapa Bay, Humboldt Bay, Coos Bay, Bodega Harbor, Tomales Bay, Drakes Estero, Elkhorn Slough and Newport Bay. Diadumene lineata has been widely dispersed around the world, primarily in hull fouling and by the movement of commercial oysters. It is established in the eastern United States in Maine and from Massachusetts to Florida, Great Britain, Atlantic Europe, the Mediterranean Sea, Indonesia, New Zealand  and in Kaneohe Bay on Oahu in the Hawaiian Islands [collected in 1999]. 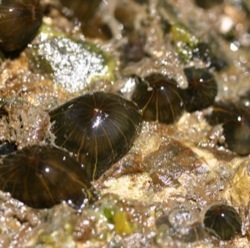 It was first collected in the western Atlantic at New Haven, Connecticut in 1892, probably introduced in hull fouling from Japan, and in the eastern Atlantic at Plymouth, England in 1896, probably introduced in hull fouling from New England. On both these coasts, subsequent spread was probably through a combination of fouling on coastal shipping and coastal oyster transplants, although an outlying population in Maine may have been introduced directly from Japan in oyster (Crassostrea gigas) shipments. Opportunities for larval transport from invaded sites in currents or in ballast water are probably limited, since Diadumene lineata rarely reproduces sexually outside of Asia; however, there may be some transport of adults on drifting fragments of eelgrass (Zostera) or seaweed. Diadumene lineata has been reported from, but apparently is not established in, the Suez Canal , Texas [1947-48] and Malaysia [reported in 1977]. Carlton, J.T. 1979. History, Biogeography, and Ecology of the Introduced Marine and Estuarine Invertebrates of the Pacific Coast of North America. Ph.D. thesis, University of California, Davis, CA (pp. 253-266). Cohen, A.N. and J.T. Carlton. 1995. Nonindigenous Aquatic Species in a United States Estuary: A Case Study of the Biological Invasions of the San Francisco Bay and Delta. U.S. Fish and Wildlife Service, Washington, DC (p. 38). Fautin, D.G. and C. Hand. In press. Class Anthozoa. In: The Light & Smith Manual: Intertidal Invertebrates of the California and Oregon Coasts. J.T. Carlton (ed. ), University of California Press, Berkeley and Los Angeles. Hand, C. 1956. The sea anemones of central California. Part III. The acontiarian anemones. Wasmann Journal of Biology 13(2): 189-251 (pp. 211-222). Morris, R.H., D.P. Abbott and E.C. Haderlie. 1980. Intertidal Invertebrates of California. Stanford University Press, Stanford, CA (pp. 63-64). 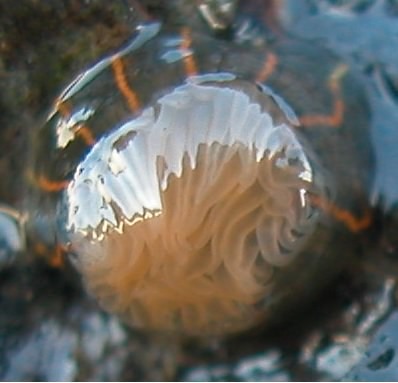 Diadumene lineata with bright orange stripes and transparent tentacles, on a high intertidal rock in San Francisco Bay. 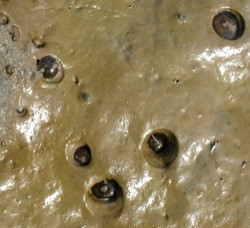 A group of Diadumene lineata in the mud at low tide in San Francisco Bay. These anemones are attached to rocks or debris below the mud surface. When the tide comes in, they poke up through the mud and extend their tentacles to feed. 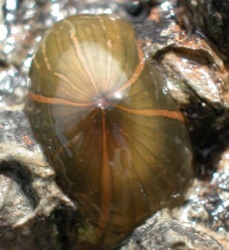 A partially closed Diadumene lineata with orange stripes and pale pink tentacles, in San Francisco Bay. A fully closed Diadumene lineata among high intertidal barnacles (Balanus glandula) in San Francisco Bay. The stripes vary from orange to flesh-colored. The stripes have formed between fine black lines that are the ends of internal partitions that show through the column. A closed Diadumene lineata with thick, gray-green stripes and a few narrower orange stripes, in San Francisco Bay. An unstriped Diadumene lineata with yellow tentacles, in San Francisco Bay. 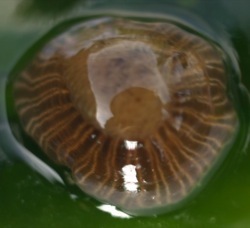 An unstriped Diadumene lineata growing on a snail (Urosalpinx cinerea) in San Francisco Bay. Diadumene franciscana from San Francisco Bay, growing on a green seaweed (Ulva lactuca). 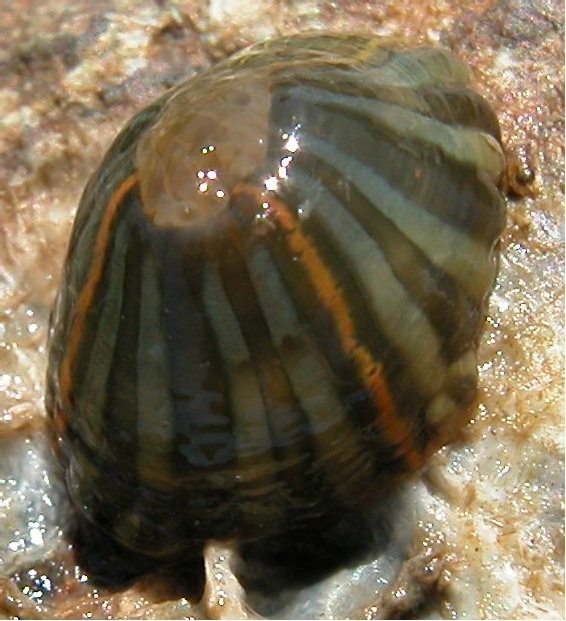 Specimens in the bay often have double stripes, as seen here, though specimens with single stripes or no stripes also occur. Diadumene lineata from Tanabe City, Japan. 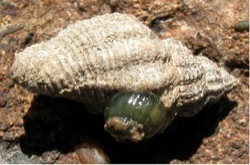 Diadumene leucolena from San Francisco Bay. The pale vertical lines on the column are not pigment stripes; rather they are the ends of internal partitions showing through the column. 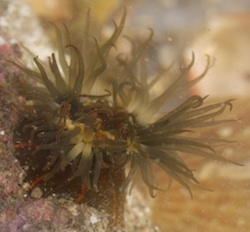 An orange anemone, similar to the European species Diadumene cincta, from Morro Bay. Also found in San Francisco Bay. The pale vertical lines are the ends of internal partitions showing through the column.